Aloha members and guests. I am honored to be serving as your president of Jodo Mission of Hawaii, otherwise referred to as Jodo Shu. I am currently a Deputy Prosecuting Attorney for the City and County of Honolulu, and a former Hawaii State Representative. I am linked to this great organization through my grandpa Maurice Karamatsu and grandma Bessie Karamatsu who were active members. Grandpa Maurice Karamatsu served as head of the Buddhist Council, and enjoyed spending time with his friends here, especially Mr. Stephen Kotake and Mr. Robert Shimoda. Mr. Shimoda told me they called themselves in Japanese, the three black birds. They were involved in Buddhism, business, and politics together, but it was Jodo Shu that brought them together. They have all passed away. My grandpa Karamatsu passed away in 1992. I have always attended Jodo Shu services and events since I was a child, but in the 2000s, I began to participate more frequently with my grandma Bessie Karamatsu. Although she didn’t say it, I could tell my grandma was happy that I showed interest. On May 1, 2006, my grandma Karamatsu passed away, and later that year, I was asked to take over her seat on the Board of Directors of Jodo Mission of Hawaii. Both of my grandparents have a niche in the back of the church. Many of you have ancestors or friends that were members here as well. As president, I will do my best to continue their legacy. Our board will support Jodo Mission of Hawaii’s services and events that reinforces our efforts for a more peaceful world. We will raise funds so we can maintain our services and facilities. We will network with other people and organizations to further expand Jodo Mission of Hawaii. Finally, and most importantly, together with all of you, we will spread compassion and love to all people we come in contact with. I wish everyone good health, success in all your endeavors, and happiness and joy in 2011. Thank you. Tonight, Saturday, January 22, 2011, I attended Stars of Hope, Honoring Individuals Who Shine in Our Community by the Hata Foundation at the Pacific Club from 5:30 P.M. to 10:00 P.M. I’m proud of Liz Hata for her efforts to help children in need such as a scholarship for a boy who lived homeless with his family and a girl who nearly died from an illness. On Friday, January 22, 2011, from 5:30 P.M., I attended the South Oahu County Farm Bureau meeting at the Hawaii Agricultural Research Center in Kunia, Oahu. I attended the 2011 Legislative Opening Day on Wednesday, January 19th. I sat on the floor of the House of Representatives with Prosecuting Attorney Keith M. Kaneshiro. After, I greeted over 60 legislators with another Deputy Prosecuting Attorney, Tricia Nakamatsu. I also talked to a number of staff, advocates, lobbyists, and constituents. I attended the Sony Open today, Sunday, January 16, 2011 at the Waialae Country Club. I watched Shigeki Maruyama play throughout the afternoon. 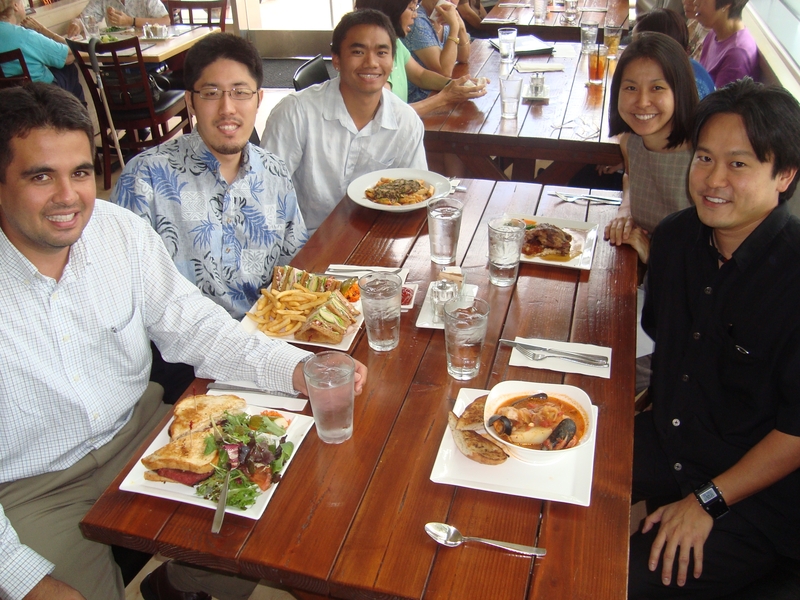 On Thursday, December 30, 2010, I took my team in the Legislative Division, Department of the Prosecuting Attorney, City and County of Honolulu, out to lunch at Tango Contemporary Cafe. From left to right: Ainoa Naniole - Winter Law Clerk, Bryce Tanaka - Winter Law Clerk, Paul Lacuesta - Clerk, Tricia Nakamatsu - Deputy Prosecuting Attorney, and I. Earlier this week, I placed a pair of kadomatsu & mochi at my house and office for good luck. Tonight, we popped fireworks to protect us from negativity and evil spirits, and ate soba and ozoni for good luck at my uncle and aunty’s house. Tomorrow, my family and I will pray to our ancestors, compassionate leaders before us, and to all souls who are suffering at Jodo Mission of Hawaii (Buddhist Temple). I will buy some omomori there for good luck. Then, we will pray and get blessings at Izuma Taishya (Shinto Shrine) where I will get more omomori. Omomori protects you from evil spirits because they are drawn towards it instead of you.